The prime minister offered advice on taking exams, parenting and technology. But some in the audience complained that he offered little new. 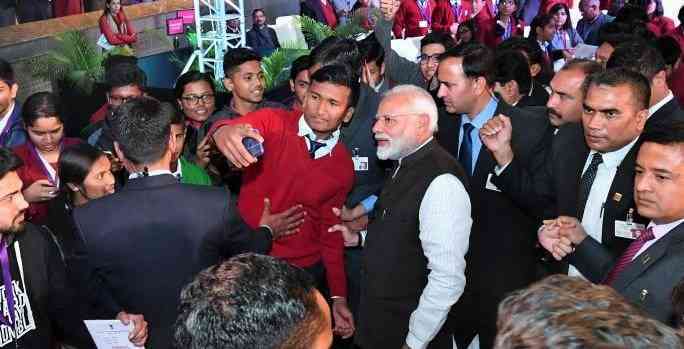 Given a chance, Zia Bhatt, a Kashmiri researcher at a Rajasthan university, wanted to ask Prime Minister Narendra Modi how students in his state can do better in exams and handle stress in the face of police encounters and internet shutdowns. Utkarsh Shrotiya, a college student from Indore, had wanted to ask why seats are reserved for backward communities in higher education. The minimum scores required for admission are lower for reserved seats. As it turns out, neither of them had the opportunity to put their questions to Modi at this second Pariksha Pe Charcha, or discussion examinations, held in New Delhi’s Talkatora Stadium on Tuesday. Although the event had been billed as a “town hall on subjects related to examinations”, questions were not picked randomly from the audience of school and college students who had taken an online test to qualify for admission. Instead, the moderator had a pre-decided list of names of students, teachers and parents and their questions translated into Hindi. Some came from students studying in Kendriya Vidyalayas abroad – Kathmandu, Moscow, Kuwait, Tehran. Two came via television news channels. Organised by the Ministry of Human Resource Development, the first Pariksha Pe Charcha was held in February 2018, the same year the government reintroduced public exams for Class 10 in Central Board schools. 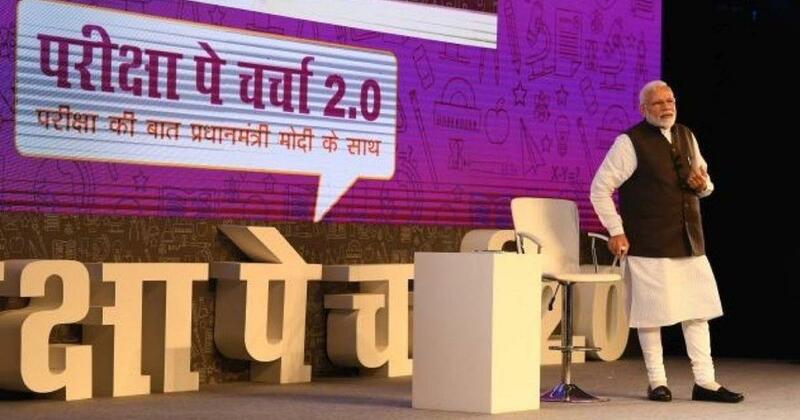 Like in 2018, the event was broadcast live on Doordarshan and social media websites. Schools from across the country were instructed to organise screenings. Though there is still a controversy about Modi’s own MA degree in “entire political science” from Gujarat University, a course that the institution has apparently never offered, the prime minister is the author of a book on excelling at academic tests titled Exam Warriors. In response to questions on stress, managing time, setting targets, competition and performing poorly in certain subjects, Modi offered a mix of parenting advice and self-help clichés. Parents were advised to not compare their children to others or insist that their children fulfill the dreams held by their fathers and mothers. 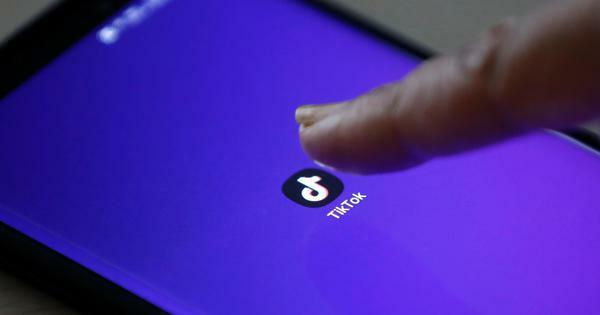 Parents must “remain connected” with and observe their children closely even when they are no longer toddlers, he said. Teachers must look beyond the few children in their class who always raise their hands to answer questions. Responding to a question on addiction to online games, he held forth on the safe use of technology. “Yeh PUBG-wala hai kya?” he asked to raucous cheers. This reference to PlayerUnknown’s Battlegrounds, a popular game on mobile devices, helped convince the young audience of about 2,000 that he knew something about their lives. A student asked how the examination system helped fulfil the professed aim of education – all-round development. He encouraged students to “pursue knowledge”, encouraged teachers to make the syllabus “relevant to life” and remarked that the education system “has delinked education from life and linked it to examinations”. Despite this, Modi remains a strong votary of a formal examination system. “Exams are not bad – having benchmarks never is – but it is how we see them and deal with them [that matters],” he said. “Exams are opportunities. See exam as festivals.” Students were advised to set targets that are “within their reach but not in their grasp”. He recommended counselling for the depressed and urged them to find someone to talk to or at least, commit their thoughts to paper. But the interaction offered no revelation, no fresh insight, students complained. “We have heard the same thing hundreds of times over,” said A Class 9 student from a private school in Delhi. “The questions were also pretty generic and everybody asked essentially the same thing.” However, she also felt Modi “made it relatable” and that “he knew his audience”. Seventeen students from her school attended the event. During the course of the question-and-answer session, several students raised their hands to ask questions but were ignored. Given the hoops they had to jump through to attend, they had expected “more interaction and more extempore questions and answers”, said Salil Tripathi from Guru Gobind Singh Indraprastha University, Delhi. 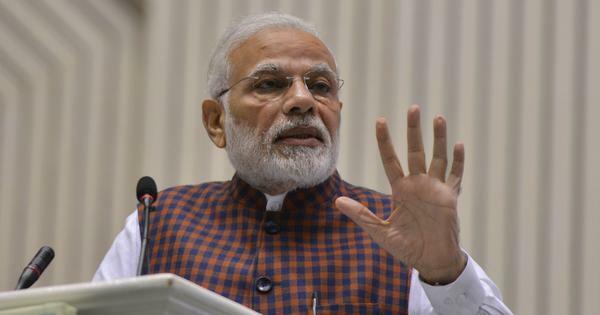 Vedant Deepak Gite, a student of VIT University in Tamil Nadu, had hoped to get prime minister’s view on the different standards demanded by the central and state examination boards. Gite had hoped to also discuss the low salaries paid to primary-level teachers in many schools and how that impacts learning in the long-term.